Ok, so you don’t always want a default class template for every type of class. I have to create a bunch of classes that implement Serializable and if the class template assumed this, that would be great. However, I don’t want my default class template to assume this. So here is what I did broken down into four simple steps. Open or create a c# project. Add the text and the variables to replaced. Export the item as a template. Step 1 – Open or create a c# project. Ok, so any project will do. I used an existing project, but you can create a new one if you want. Any C# project should allow this to happen. 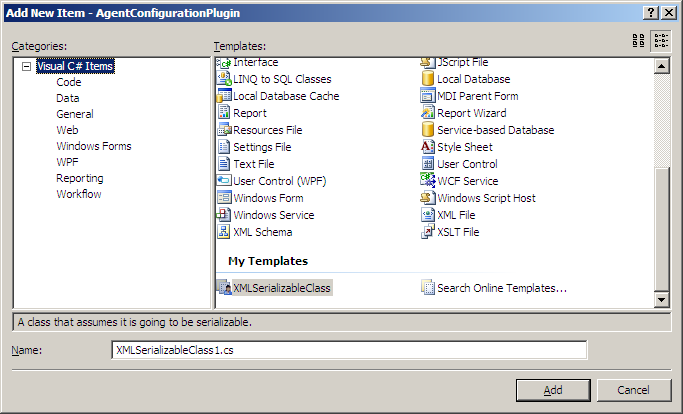 Step 2 – Create a class file. In one of my C# projects in Visual Studio, I created a new class called XmlClass.cs. In Visual Studio, chose File | Export Template. This starts a wizard that is extremely easy to follow.Note: If you have unsaved files in your project, you will be prompted to save them. Chose Item template, select your project, and click Next. In the next screen there was a tree view of check boxes for all my objects. I checked the box next to my XmlClass.cs. In the next screen, provide references.Note: I added only System and System.Xml. In the next screen, provide a Template name and a Template description. You should now have the option under My Templates when you add a new item to your project. This class will be useful and will save you and your team some typing when you are in the class creation phase of your project and you are creating all your Serializable classes.